Well it's official. Or as official as any "un-conference" can be. I just finished a chat session with three of the smartest people I've entered a Google Talk session with. Alright, it was my first time using Google Talk, but they are pretty smart. 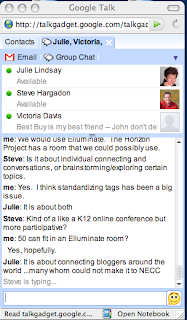 Julie Lindsay, Steve Hargadon, Vicki Davis, and I discussed a few of the formalities surrounding an international version of EduBloggerCon. In our discussion, we decided it would be best to allow for asynchronous communication - accompanied by occasional "live" sessions - dates and methods to be determined later. What's the name of all this madness, you ask? 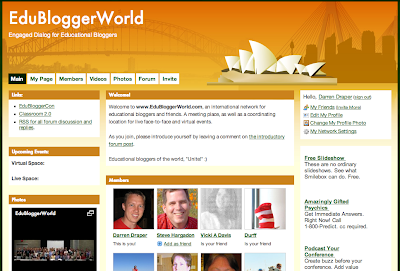 EduBloggerWorld - coming to a Ning near you. Steve has done an excellent job in creating an online community in which we can all participate - the official URL of which is http://www.edubloggerworld.com/. It is our hope that this site will serve as the home and planning location for future, international versions of EduBloggerCon.